After 4,863 miles of shifting nirvana (5,217 total miles on my Di2 drivetrain), today I had a bad shift. I’ve grown so accustomed to absolutely perfect shifting with Ultegra Di2 that this was a rather soul-wrenching experience. The reason I don’t have 5,217 perfect miles is that it took me a little over 300 miles in the beginning to figure out that Di2 is less forgiving of lateral chain sway than a conventional drivetrain. Once that was solved, Di2 has been a dream. What follows is the reason my record of perfect shifting ended today. At the beginning of one of my usual rides, I felt a strange sensation at the rear of the trike and suddenly jumped three or four gears without touching the shifter. I was filled with dread as distant memories of crappy shifting flooded over me. Thinking maybe I had run over a stick, I pulled over to check it out. Everything looked fine and perfectly aligned. I didn’t see a likely stick. I continued on but discovered that after third gear (one and two were OK), the derailleur was making a lot of noise and wouldn’t always shift when I told it to, or would shift more than one gear. Inconceivable. I pulled over again, this time wondering if that strange sensation was the rear wheel becoming unseated in the dropouts. Maybe my quick release had come loose and the wheel was misaligned. The quick release was tight but I loosened it and retightened it anyway. I didn’t notice the wheel shift at all relative to the dropouts. Continuing on, the drivetrain was still acting up. This time I stopped to either figure out what was wrong or turn around for home. I noticed that the floating chain tube holder was oriented strangely. Due to a couple of unfortunate design decisions by ICE that I’ve complained about in the past, a chain tube is necessary on the drive side where the chain passes the frame hinge and rear rack. 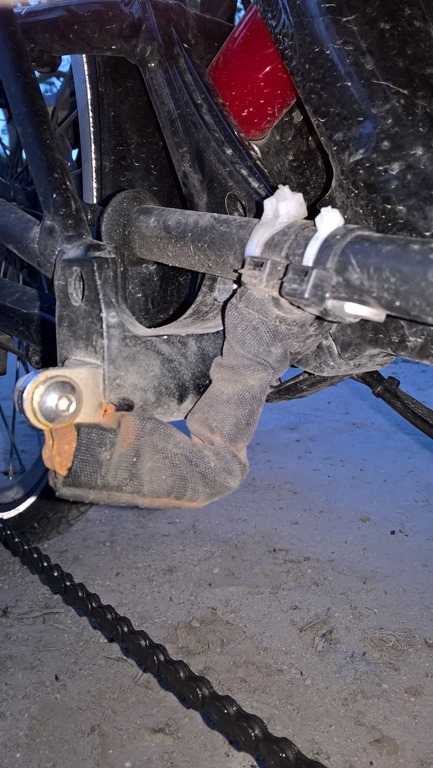 Rather than run the ICE chain tube all the way to their usual bracket at the idler, I installed a shorter tube and fixed it with the floating chain tube holder, a rather ingenious use of a short piece of bicycle chain that I discovered at Portland-based Terra Cycle. It allows the chain tube to follow the chain as it moves up and down the rear cassette, but because a chain doesn’t move much side-to-side, prevents the tube from moving fore and aft. 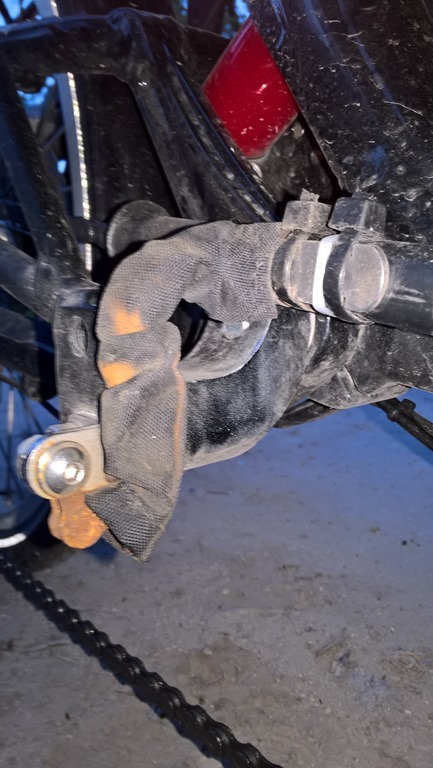 One downside though is that after a rough winter of commuting, the short piece of chain was quite rusted and managed to get stuck in a position that didn’t allow the chain tube to move freely. I popped it down to its normal position where it still moves freely enough, even with the rust. Problem solved. I speculate that a stick did run through my derailleur and on the way knocked the chain tube holder into a bad position. I completed the ride with no further drama. Not to put too fine a point on it, in about 2 years and 5,000 miles of perfect shifting, I performed absolutely zero maintenance on the drivetrain. Not a single adjustment. Didn’t have to lube, fiddle with, or replace a cable throughout one of the worst winters of commuting I can remember, and the winter before that. Nothing. Of course I’m not counting my way-too-infrequent chain cleaning and lube, nor eight overnight charges. To keep my shifting smooth before Di2 I would have easily had eight bouts of maintenance with my drivetrain in that timeframe, none of them as easy as plugging in a charger overnight. And in the best case, my shifting still wouldn’t have been as smooth and precise as Di2. Today I had a bad shift, but I look forward to the next 5,000 miles of perfect, maintenance-free shifting. This entry was posted in Sprint Di2 and tagged Shimano Di2 Ultegra on April 29, 2017 by Kurt.